It’s the week of Thanksgiving, and I have so much to be thankful for, that I should have started last week! But I’ll get around to all the thanking I need to do, it’ll just take some time. First off, I’m so very, very thankful for my boys, my husband and the rest of our family. Even when insanity is at its highest, there isn’t a moment that I don’t realize just how lucky I am. Last week one evening, Big Bro came home from school and as we were working on his homework he said to me, “You know Mom, I’m so glad that I have you. I’m a pretty lucky kid.” After wiping away the “dust” in my eyes, I told him that I was the lucky one. And I am. Second, I’m thankful to be living in a country so great that we have the freedom to choose so many aspects of our lives. We can choose who we want to be, what we want to do, where we want to go and how we get there. (Even if it means the discomfort of an up-close-and-personal pat down!) These choices are ever-present and sometimes overwhelming, but I’m thankful for them none-the-less. I’m thankful for my fellow farmers and fellow ag-related friends. The amount of time and dedication that goes into agriculture-related fields is amazing, and it truly becomes not just a job, but a way of life. To the point that trying to imagine your life outside agriculture is on level with trying to figure out which of your children is your favorite, it’s just not possible. I’m thankful for the food that is produced by ALL of agriculture. Organic, no-till, conventional, cage-free, free-range, traditional, grass-fed, corn-fed, grain-fed, whatever the buzz word of the day is, whatever your production methods may be, the world needs it all. As long as people are going to bed hungry at night, as long as children wonder where there next meals come from, whatever it takes, we need to keep producing the safest, most cost-effective food source possible. Don't you wish you could lick the inside of your nose with your tongue? 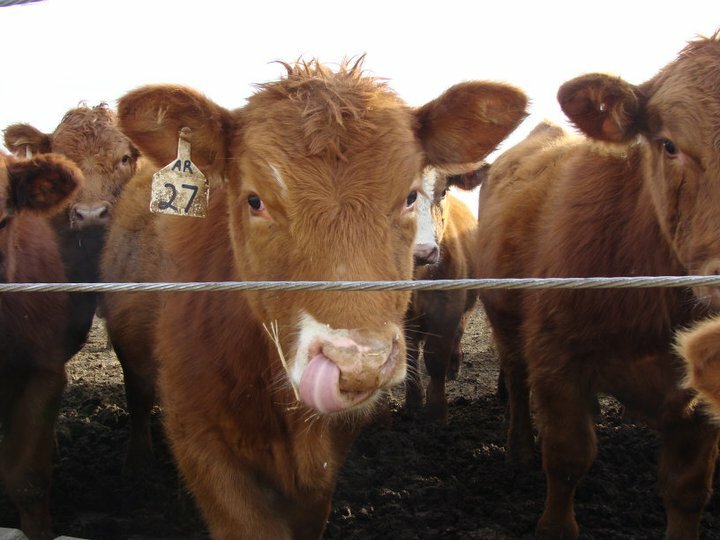 This entry was posted in Agvocacy, Cows, Farm life, Food freedom and tagged agvocacy, children, children farming, cows, farm life, farm questions, farming technology, feeding the world, food choices, life on the farm, school work by wagfarms. Bookmark the permalink. Let’s just say that winter has truly set in here in the north, and sometimes your driven to the brink! 🙂 It’s one of my favorite snapshots though! I have to give a shout-out to my sister-in-law for sending me the pic! She takes GREAT photos of our bovine friends!